To book ahead or not to book ahead, that is the question ? I know that sounds a bit like a Shakespeare quote, but it’s a very common question that we get asked a lot. Is it best to book your cruise in advance or wait until the last minute? Recently we returned from the Allure of the Seas. During that cruise I attended the past passenger party. At the party a passenger took to the stage and spoke about all his cruises and how he books them. He had some very interesting comments that I wanted to share with you. This man who has been on over 100 cruises in the past 5 years did a spreadsheet to track the benefits, if any, of booking ahead. He generally books all his cruises 2 years in advance, once the schedules become available. He discovered that 70% of the cruises he had booked had increased in price from the time they booked it until the ship had sailed. 15% of the time the prices had remained exactly the same, and the other 15% of the time they had decreased in price. He made the comment that if there was a machine in the casino that consistently paid off 70% of the time he would play it all the time. That’s a very true and smart statement. He also said that if the price does happen to go down before the final payment date then the travel agent will protect it and adjust the fare to the new lower price. “So how can I lose”, he said. Another very good point made. 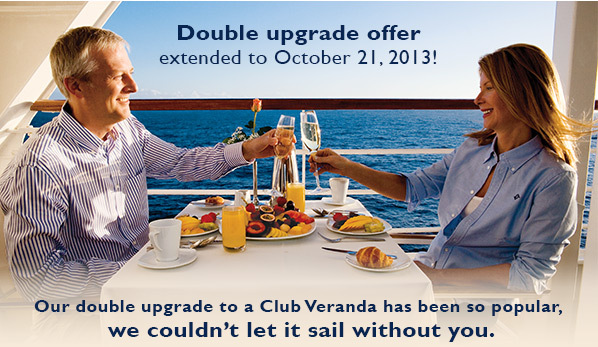 He also followed up with the fact that by booking 2 years in advance he also gets the best cabin choice available. The moral of this story is that buying your cruise in advance will give you the best price and location 85% of the time. If you are one of those people who have a very flexible schedule and can go at the last minute (and take advantage of that rare 15% discount) that’s great. Your cabin may not be in a great location, but at least you got a good deal. A trip to Las Vegas is cheap….NO, it’s not! We just returned from a national convention in Vegas and spent 5 nights at the Paris Hotel and Casino. Do you know that you can almost go on a premium deluxe cruise or a romantic and picturesque river cruise through Europe for about the same amount as a trip to Las Vegas will cost you? If it’s been a while since you’ve been to Vegas it has changed! It’s not like the good old days when there were lots of bargains; those days are gone. You will no longer find $59 per night luxury hotel rooms, or all you can eat steak and lobster buffets for just $8.99. Since Las Vegas has welcomed the culinary invasion of Chefs like Wolfgang Puck, Emeril, Bobby Flay, Gordon Ramsey and others, the prices in Vegas have sky rocketed. 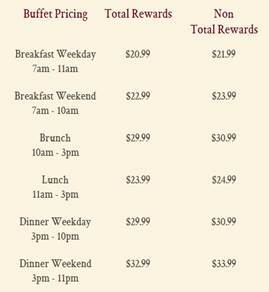 These days you will have to look long and hard to find a basic dinner buffet for under $33.99 per person. I have attached a copy of our breakfast receipt. You will see that my wife and I did not over indulge. We each had a cup of coffee and a glass of juice. We shared one croissant. Lanette had a quiche and I had the Skinny du Jour which was a crepe with fresh berries and crème – that’s it – and it cost over $60 with a tip for just 2 people. So it’s VERY easy to spend over $30 per person for breakfast for a very average size breakfast. Dinner at Roy’s was supposed to be less expensive since we decided to eat off the strip that night. 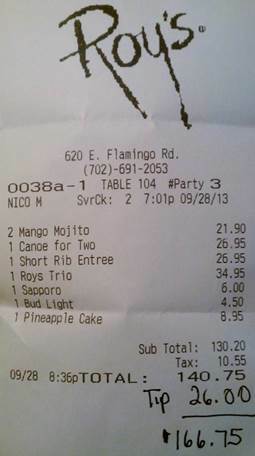 A cocktail was almost $11 each; the “canoe for two” at almost $27 was an appetizer plate. My Roy’s Trio was a very small sampling of three different fish portions and we split one dessert. Again, almost $85 per person by the time we paid a tip. I hate going on vacation constantly budgeting every drink, beer, and menu item that I eat and drink throughout the day with the fear of what my bill will be at the end of my vacation. Vacations are supposed to be stress free…not stressful !!! Let’s be honest, if you’re going to entertain yourself in Vegas you will have to purchase expensive excursions to the Grand Canyon, Hoover Dam, or spend lots of money on admission fees, cover charges to clubs, gambling and shows. And good luck finding a decent show for under $75 per ticket. A good seat (I stress the word “good”), will cost $125-$300 for shows like Blue Man Group, “O”, Elton John, Celine Dion, Jersey Boys, etc. For those of you who say you can drink for free in Vegas, are you really drinking for free when you’re sitting on a stool pouring money into a machine? So if you think a trip to Europe on an upscale line is too much money and a trip to Vegas is cheap you are wrong! I included a spreadsheet table below that will provide you with a comparison. Now I will admit that airfare to Europe will cost more money than a trip to Vegas but that’s about the only benefit Vegas has over Europe, in my honest opinion. Lets’ be honest here. When you are on vacation you want to let your hair down, relax and enjoy yourself. You won’t enjoy yourself that much if you’re constantly watching every dollar you’re spending, or limiting yourself on drinks, sightseeing options, shows, etc. So I encourage you to expand your horizons the next time you’re planning on taking a vacation. Hotel w/ taxes $176 or $88 p.p. $399 p.p. $408 p.p. $335 p.p. $757 p.p. $393 p.p. Tours additional included $100 p.p. $100 p.p. included $100 p.p.